It’s All In The Name • Run Hard. Rest Well. Names are important. Names of people and places are important, but so it naming our sin. Do you do that very often? If I don’t know the name of my besetting sins, I distance myself from my highest goals and God’s greatest good. Some people despise “labels.” I love a good (and accurate) one. A number of my children fought mystery illnesses. Some for years. These nameless monsters almost ate us alive. Once named and known, we knew the beast that we were fighting. It made all the difference in the world. My sin is the same way. Until it can be named, claimed and brought before the Throne, it is an evasive enemy out to devour and destroy me and those I love. Alcoholics Anonymous has it right, and the people of God have much to learn from this great group of people when it comes to transformation. We need to fill in the blank. We must fill in the blank. A hoarder. A Guilt-monger. Obsessive. Self-centered. A tyrant. A pushover. A fraud. How can we dare be so bold? So honest? So vulnerable? 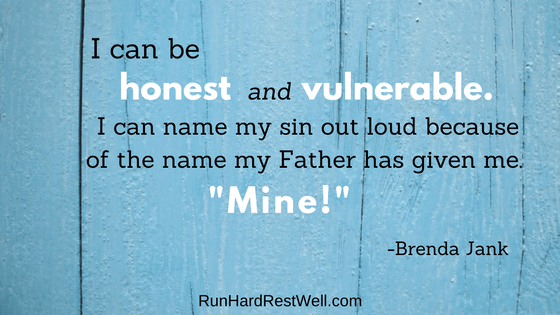 Because of the name my Father has given me. How much do the consequences of my besetting sins bring unrest into my life? James 5:16 encourages us to name these out loud. Who is your safe person? Your safe group? Don’t be afraid. Thanks so much, Brenda!! Great way to start the day, getting out of His way and resting in His promises!!! Blessings and strength for you, Sister! Matthew E. Konow Executive Director Cross Connections, Inc. The Mission of Cross Connections, Inc. is to provide affordable, Biblically based professional counseling and to train lay counselors (Covenant Partners) in offering Biblical guidance to others. Matt — Your words of encouragement mean a lot and your prayers are a treasure. I love these simple truths. Why do we resist them? The Truth will set us free. Ohhhh! The truth will set us free. May we embrace and soar! For many years I was frustrated and fought for healing….growth. I was tired of snipping leaves off a rotten tree. I wanted the tree gone…the roots gone. I didn’t want the sins and failures to keep coming back. They did. Once I was able to take a sin, call it sin, follow it back to the root, then, and only then, could I get past it. Only then could the sin be broken. I love your words, Brenda. They are so true. Love and prayers. Jesus’ Truth transforms, comforts, empowers. We will rest in Him today.